Wheatie, a troubled, leggy, and very stoned co-ed has a huge chip on her shoulder. She wanted to be a ballet dancer. Her wealthy family forces her to be a journalist. She must deliver a make it or break it unique paper about the sixties. If not, she will fail a much needed college class. If she fails, she suffers the ire of her financially manipulative parents and the chip gets heavier. Butchie, a sixty-something once well respected romance writer has a few problems. Multiple divorces torpedoed his finances. He suffers from writers block. The romance novel he’s promised to his agent and publisher is at least six months late. However, he’s blown the advance money on booze and temporary love. What creative energy he has left is devoted to fulfilling a promise to the most influential person in his life— a teacher. On a warm summer’s day in New York City’s West Village the two collide. Their lives become inextricably intertwined. Butchie takes Wheatie on a tour through the reckless magical joy ride days of the raucous 60’s. The pair fast-forward through the decade with Butchie reliving his youth. Wheatie transforms into a hippie while she travels along. At the end of the tour, Butchie shepherds wide-eyed Wheatie to the Fillmore East. It’s December 1969, and they’re at a most special of all concerts. One held just for her! This story may confirm, or change your mind about the sixties. Likely, it’ll make you laugh out-loud. And really, doesn’t everyone Wannabe-something? 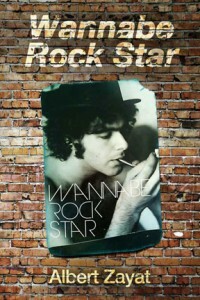 Get your print version of Wannabe Rock Star In now!